I have a little treat in store for you this week. In my renewed commitment to be sugar-free-abstemious, I was reminded of a delicious holiday treat that I made a few Christmases ago during a holiday bake-a-thon on a trip home to be with the fam. In order to get through the hols with my sanity and waist-line in tact, I had a few sweet treats in my arsenal that completely saved me, and this was one of my faves... You can read the old post HERE. In food processor, blend all ingredients but coconut, until mixture is smooth. 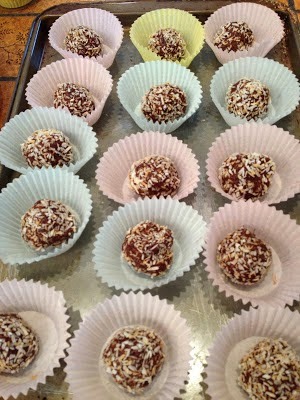 Add more coconut oil if mixture appears too dry to roll into balls. 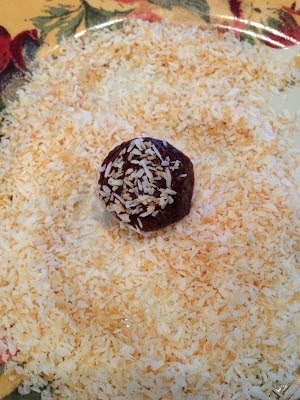 Take generous teaspoonfuls and roll into balls, then roll in coconut. Store in tightly covered container in fridge. To serve bring to room temp. Each one 121 calories, 2 g protein, 10 g fat, 8 g carbs, 5 g sugar (naturally occurring not added) and 2 g fiber. I hope this offers a little comfort and joy and helps get you through the season without breaking the caloric bank! These look and sounds really yummy Shan! I think I need to make the effort to make a few healthier treats too, so will have a go at these very soon. They are delicious and healthy! I think you're really like them, plus they're dead simple to make! !